India Culture is Vibrant, Colorful and Rooted in Rich Tradition. India Culture is rooted in colorful traditions that date back to its ancient history. During this time period, the Indus Valley Civilizations of ancient India were born. A civilization known as Harappa, created a religion that is now considered the oldest living religion, Hinduism. The traditions, ceremonies, rituals, arts dance and other aspects of Indian culture developed here and were created by the Indian people. Indian people have found ways to incorporate rich and beautiful color into nearly all aspects of the culture in India. You can find unique colors in beautiful rugs, paintings, clothing, textiles, architecture, Indian food, and state symbols like the flag of India. The culture and foods of India go hand-in-hand. And it's amazing how much more color is used in traditional Indian weddings in comparison to the traditional weddings of United States! My wife and I were married in the city of Ahmedabad, in the state of Gujarat. In Gujarat, colorful and often bejeweled dresses called Saris are customarily worn in place of the white gowns of the United States. Brides also sport jingling bracelets called bangles and often wear stunning gold jewelery sets too! In Indian culture, men don't traditionally wear tuxedos. In India; men wear long shimmering coats, silken pants, and often times a turban. Of course, India is a very large country, and wedding outfits and customs can differ by each regional culture in India, as well as by wedding budget. Whatever the case may be, you can certainly expect to see color in an Indian wedding! Here, a gorgeous bride displays her traditional wedding sari, bangles and jewelery that were worn at her wedding. Indian family culture is considered to be the most important part of its culture. A family typically has a powerful influence over choices made by its individual members, and of their communities. Another amazing thing about this culture is that its original core values have not really changed very much; although, India culture of today does have its differences. There has seemingly been very little cultural influence to a country that was controlled by the British for nearly 200 years! Seriously, the culture in India basically remained in tact! Once you visit, you'll understand why. The Indian people are very proud of their cultural values. Outside cultural influence has generally been avoided because western values are very different from those of traditional Indian culture. 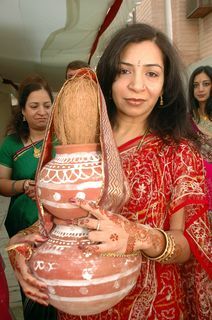 Our aunt holds a coconut in a vase during a wedding ritual. However, in modern culture, younger generations have shown increasing interest in western culture and philosophies. They have adopted many western ideas as their own. Meanwhile, older generations stress the importance of rooted, traditional values; this conflict of ideas has created a struggle between these generations to try and find common ground while defining the nation's culture. One thing that has stayed the same is the fact that festivals, celebrations and rituals are fundamental to culture and lifestyle. Festivals include holidays like Diwali and traditional celebrations like Garba. Celebrations in India are often related to coming of age milestones like weddings and delicious Indian food is often the centerpiece of these cultural events. Food plays an important role in India Culture because it represents the family, and community, connecting and sharing socially. A fun congo line style dance at our Garba Ceremony, prior to our wedding. An understanding of the culture in India plays a major role in doing business in India. India business culture must be understood in order for outsiders to successfully do business in India. India culture has also played a large role in shaping the India's history. Leave to discover interesting facts about India! Find out what your Dosha is on our friends site! New! CommentsHave your say about what you just read! Leave me a comment in the box below.